The names in Eternal Punishment may be a little unfamiliar, but the game is the same. 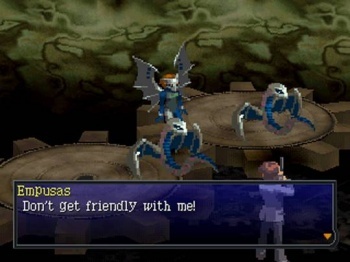 Persona 2: Eternal Punishment - not to be confused with its sinister twin, Innocent Sin - is finally seeing re-release. A localized 2000 PlayStation edition of the game has been brought to the PlayStation Network, as a PSOne Classic. It's pretty much exactly as it was - graphics and gameplay included - when it first saw the light of day; "unusual circumstances", according to the PlayStation Blog, are to blame for lack of a localized PSP version. "You'll still control a party of oddballs brought together by disturbing goings-on in Sumaru City," promises the PlayStation Blog; "teen-focused magazine reporter Maya Amano, her unlucky-in-love boxer friend Ulala Serizawa, the upright police detective Katsuya Suou, and a shady Taiwanese fixer known as 'Baofu.'" They've banded together to get to the bottom of the Joker Curse, all the while being dogged by a strangely familiar looking boy. "The one thing that might throw players who got their start on the PSP or Vita is that a few of the names might seem unfamiliar," says the PlayStation Blog. It's a localization thing; because this is an older version of Persona, some of the names were altered to better fit American naming conventions. If you're keen to know who's who and who isn't, there's a complete list over here. This one's $9.99 on the Store, so if you've been waiting patiently to complete your Persona journey, today could be your lucky day. Update: Initial reports indicate a problem with this title. Though intended for PS3, Vita, and PSP, the PS3 version is the only one working at the moment. Sony's Morgan Haro has apologized for the problem, and estimates a fix time of a few weeks, in the very worst case scenario.